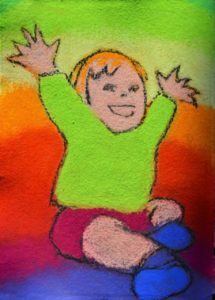 ‘Let Hope Grow’ is a collaborative project between researchers, artists and families that aims to use artistic imagery to promote early intervention and inclusion for young children with developmental disability. On 26th March, the works were exhibited for the first time in the UK at LSHTM, as part of the launch of the ‘Ubuntu’ hub website for ICED child disability programmes. 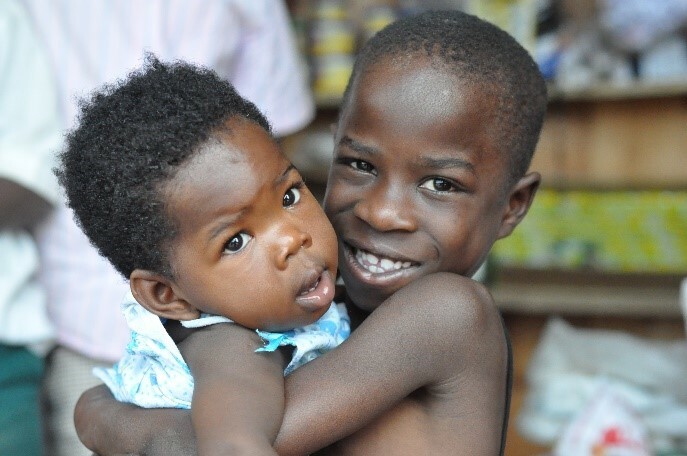 Following this, The Lancet Child & Adolescent Health have published a review of this innovative project. The UN Global Strategy advocates for children to not only ‘survive’ but also be able to ‘thrive’ and ‘transform’ the communities where they live. What can we learn from survivors of newborn conditions who are at high-risk of childhood disability, and their families, to help them thrive? What could a truly inclusive world look like? This collection of works aims to support early intervention and inclusion, optimising the health, wellbeing, and life opportunities for affected children and their families. 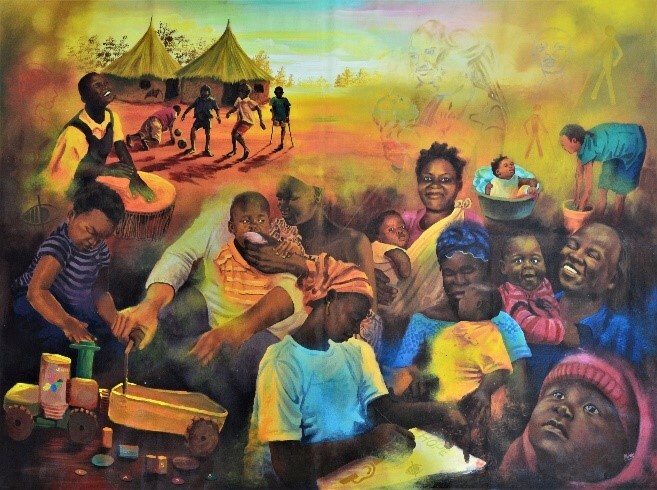 Ronald Mugabe, a commissioned Ugandan artist with Hope Arts Uganda, attended research clinics to meet with our families and learn about their lives, the hope and the hardship, which inspired his paintings and this exhibition. In collaboration with other artists, a portfolio of images has been created that conveys the love, laughter and tears of caring for these special children. 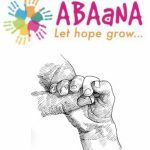 The experiences of families participating in our ABAaNA Early Intervention Programme research in Uganda have been documented through photography since 2012, by Dr Karen Martin, a paediatrician who led the formative work for the early intervention programme. 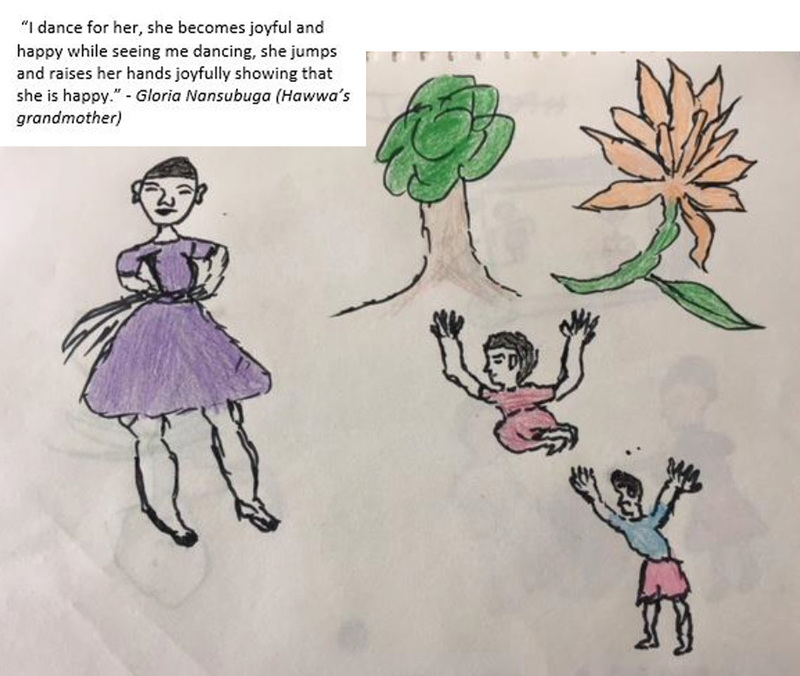 On World Cerebral Palsy Day 2018, the families were invited to an art workshop in Kampala and encouraged to communicate their experiences of caring for their children both verbally and artistically. London-based artist, Joanna Lawn (Instagram: @nothing.bettertodo) was commissioned to produce line drawings for the ABAaNA early intervention programme manual. These delicate illustrations provide a visual aid for supporting children with disability; demonstrating normal developmental milestones, and optimal techniques relating to positioning, carrying, feeding, and supporting communication, stimulation and play. We also displayed works from UK artist Alison Meek, who was inspired by meeting Astrid, who has Down’s syndrome, and her family in the UK. It has been a real privilege to work with the wonderful children, families, artists, researchers, public engagement team and others, who have shown such enthusiasm and commitment towards providing a voice for the families of children with disability. A selection of works will be on display at LSHTM’s Seacole Social Café until the end of April (check Easter opening hours), and at the RCPCH annual conference on 14th May. Later in the year they will be moved to an exhibition space in Kampala, Uganda.